Joe Burke currently serves as the 15th District Court's chief judge. He is unopposed in this race for a six-year term. Burke was initially appointed as judge to the 15th District Court in February 2012. The appointment was made by Republican Gov. Rick Snyder to replace Julie Creal, who had resigned the previous year for health reasons. 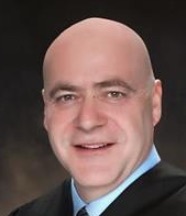 In late 2015 Burke was named chief judge by the Michigan Supreme Court. In the 15th District Court, Burke presides over landlord-tenant, general civil and drunk driving cases as well as the specialized Sobriety Court docket. Burke worked as a Washtenaw County assistant prosecuting attorney from 1982-1986. In 1986 he became a partner at the law firm of Burke & Rennell PC. He worked in private practice until returning to the Washtenaw County prosecutor's office in 1993, serving as chief assistant prosecuting attorney. He has served on the boards of several local nonprofits, including Neighborhood Senior Services, the Humane Society of Huron Valley, the Washtenaw Council on Alcoholism, Dawn Farm and the Washtenaw Community Concert Band. He plays the trumpet. Burke is the youngest of 10 children. His grandfather, George James Burke Sr., was a judge in the Nuremburg war crimes trials and served as Washtenaw County prosecuting attorney in the early 1900s. Burke received a bachelor’s degree in 1978 from Michigan State University. He earned a law degree from Thomas M. Cooley Law School in 1982. Burke is married to Marilyn Eisenbraun, who is also an attorney. Burke's campaign treasurer is Russ Hines.